Heat gas or charcoal grill. 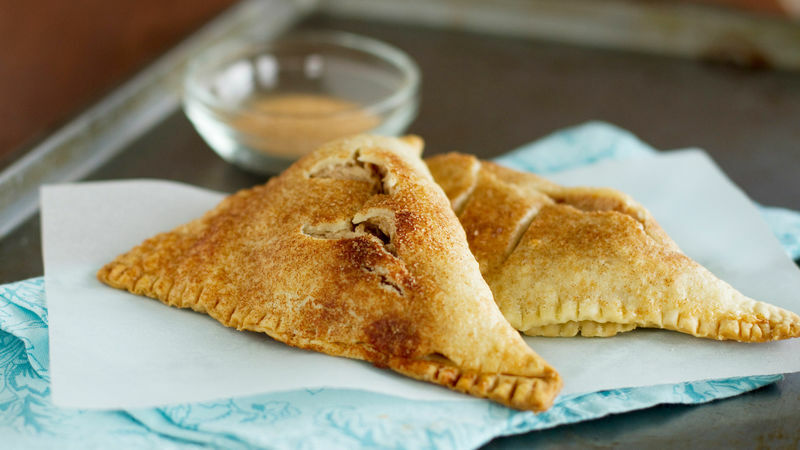 Remove pie crusts from pouches; unroll on work surface or cutting board. With pizza cutter, cut each crust into 4 equal pieces. In medium bowl, beat cream cheese and 3/4 cup sugar with electric mixer on medium speed until smooth. Add egg, flour and 3 teaspoons of the cinnamon; beat until combined. Divide cream cheese mixture evenly among crust pieces. Fold crust over filing; press edges firmly with fork to seal. Brush tops of pies with whipping cream. In small bowl, mix 1 1/2 teaspoons sugar and remaining 1/2 teaspoon cinnamon; sprinkle over tops of pies. Cut 2 slits in top of each pie. Spray sheet of heavy-duty foil with cooking spray; place foil, sprayed side down, on top grill rack over low heat. Place pies on foil. Cover grill; cook 20 minutes or until pies are golden and fully cooked. Depending on the size of your grill, you may need to cook the pies in 2 batches. The grill temperature should be between 300°F and 350°F. If the grill begins to get hotter, turn off one or more of the burners. To bake these hand pies in the oven, preheat your oven to 425 and bake about 15 minutes until deep golden brown.